Vine now comes with spam … lots and lots of spam. It’s always nice when people comment on what you post on social media, but unfortunately a lot of the comments people are getting on Vine aren’t exactly sincere … or real. That’s because they’re spam. The Daily Dot just reported on this uptick of malicious accounts, since one of their writers noticed that a Vine spam scheme people are calling “vine jump” started commenting on his videos. There are many different user names that follow a pattern of a first name and a surname smushed together followed by another last name. And plenty of Vine users have experienced this nuisance in the form of countless comments promising them more followers if they go to vinejump.com or websites like vineluv. And they’ve taken to Twitter to express their displeasure at the spam invasion. 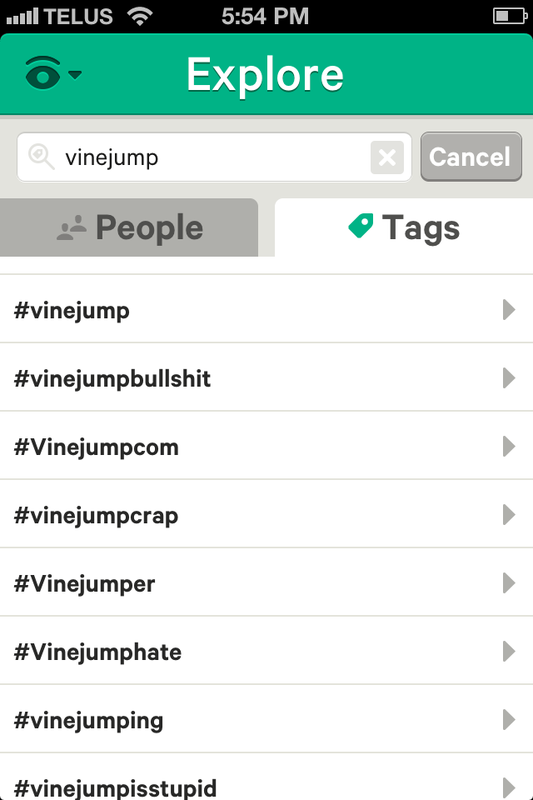 Now there’s even a bunch of hashtags, including #vinejumpbullshit, that Vine users made to tag videos about how annoyed they are at the spammers. And it’s pretty impressive how quickly people rallied to make videos to call the spammers out. This girl says she doesn’t care about vinejump.com, but she went ahead and made a video to (dis)prove her point. This guy does a great job at showing how Vine jump is the worst because it tricks you into thinking real people liked your posts. “I don’t know you. And I’m not gonna join Vine jump.” Truth. This new wave of spam is unfortunate, but it’s a natural growing pain for a new service gaining users in leaps and bounds, and considering Vine just opened up to Android users, there’s a lot of incentive for money-grubbing spammers to try and work their magic, since the rules of Vine aren’t as well-established as Twitter and Facebook and more users may not understand that clicking on Vinejump will bring nothing good. Though, from the looks of the fervent reaction against the spam, people are definitely getting savvy and taking a stand – the domain for Vinejump was only registered on June, so it didn’t take long to get the spam scheme up and running … but it also didn’t take long for a backlash.